Whatever you call them, they're not pleasant. I've been suffering with them for almost 10 years now, although in the past six months they've diminished quite a bit. At least my hot flashes are predictable. For instance, I always have one when I first wake up, no matter what time it is. I always have one just after a hot bath. I always have one when starting to drink my second cup of coffee in the morning. And I usually get at least one during handbell rehearsals. All seeming to prove the theory that hot water, caffeine, and stress promote them. However, I do not get them from drinking wine, which is purportedly another common trigger. I've tried several different "natural" remedies - black cohosh, soy products, St. John's Wort - but nothing seemed very effective. My doctor has offered to prescribe HRT (hormone replacement therapy), but I've never wanted to use it because there are too many side effects with any kind of synthetic hormones. Besides, you never know what the long term effects might be. Here's the oddest thing. When I was helping take care of my grandson just after he was born in November, I stopped having them all together. 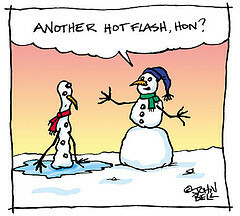 For about four weeks, I didn't have one single hot flash. But within a week of returning home they returned on their same predictable schedule. I'm wondering if just being around a baby - smelling his heavenly baby aroma, touching his tiny baby hands and feet, feeling the silky softness of his cheek against mine - could have inspired my tired old body to produce just one more little surge of estrogen, enough to prevent those hot flashes from making an appearance. If so, that's all the more reason to spend more time cuddling baby Connor. I wonder if my doctor would prescribe that for me?